This match is designed to allow centerfire rifle shooters to test the accuracy of their rifles in a structured match setting emulating 100 and 200 yard NBRSA score matches on regulation NBRSA score targets. Matches are open to any centerfire rifles under .40 caliber as divided into the classifications below. 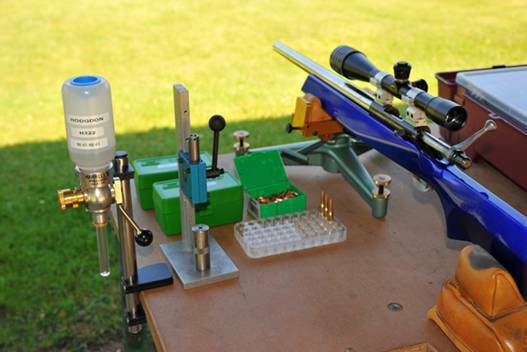 Benchrest Class: Custom rifles with glued-in actions, i.e. NBRSA Light Varmint and Heavy Varmint rifles, and any centerfire rifle not meeting the specifications of Production Class. All rifles must be able to be made incapable of firing on command. Any factory centerfire production rifle available over-the-counter, past or present. Rifles must be completely stock. No aftermarket replacement barrels, triggers, or stocks except as offered by the original manufacturer. Actions must be bolted to the stock, and glass bedding is prohibited unless done by the manufacturer as an original factory offering. No glue-ins. Triggers may be adjusted for pull weight as long as they remain safe. Factory safeties must be intact and functional. Forends must be less than 3 inches wide. Semi-autos are welcome, including those assembled from components, as long as they exactly match a manufacturer’s factory model. All semi-autos must employ a brass catcher to be provided by the competitor. The match consists of six strings of five shots as follows: one round into each of the five record bulls of an NBRSA HBR-1 target at 100 yards with unlimited sighters within 7 minutes, followed by a 3 minute rest period. The above will be then be repeated twice within 5 minutes per five shot record string, separated by another 3 minute rest period. All the above will then be repeated on an NBRSA HBR-2 target at 200 yards. This is a score, not group, match. Total record shots will be 30 rounds with unlimited sighters within the time constraints of each of the six strings. Targets identical to those used in the actual match will be provided for informal sight-in one hour prior to the match. Eye and ear protection required. Actions must be open and the rifles unloaded unless you’re actually shooting. Once loaded, or while being loaded, no rifle shall be elevated above the target or removed from the rest. All firing to be done from a seated, benchrest position off sandbags fore and aft. Adjustable and/or mechanical rests are permitted under the front bag. Front and rear rests must be separate and not connected to each other or the bench. Machine rests, return-to-battery, and/or recoil retarding rests are not permitted. Rifles must remain able to be lifted freely upward from all rests while the rests remain in contact with the bench. Muzzles must extend past the front/leading edge of the bench. Maximum rifle weight with sights shall not to exceed 13.5 pounds. One rifle per competitor per match. Spotting scopes are highly recommended and are the competitor’s responsibility. There are no optic magnification limits. Wind flags are permitted as long as they do not interfere with any competitor’s line-of-sight to the target. Competitors are responsible for placing their target frame, changing and scoring targets, and retrieving their target frames. Each competitor will score the targets of the competitor to his immediate right. The competitor on the farthest right bench will score the targets of the competitor on the farthest left bench. Each record shot will be scored from the leading edge. If there are more than three shots on any record bull, the three lowest scoring shots count. Entry fee is $5 cash per competitor. Matches are scheduled for the third Saturday of each month, May through October. The range will be closed to non-competitors and available for casual sight-in by competitors at 8:30 AM. Matches will commence at 9:30 AM. There will be only ONE relay with a maximum of 10 competitors allowed per match, so come early! Cash awards will be paid to each Classification winner as long as there are at least three competitors in that Classification. The Match Director is the sole and final authority regarding any and all phases of the match, including allowable equipment, scoring, scores (he’ll probably review all winning targets) and the behavior of competitors and observers. If you have questions or need additional information, contact the Centerfire Benchrest Match Director listed on the Contact Information web page.